Mark Andrews Flies into Best of U.K. Wrestling Set! When it comes to high-flying wrestling in the United Kingdom, no one has done it better for as long as Mark Andrews! The Welshman has been wrestling for over a decade and has made a major name for himself the past few years in both the US and the UK. Andrews has won both singles and tag team gold in multiple major British promotions and continues to perform regularly. He first appeared on the US scene in Chikara, as part of the Young Lions Cup tournament, multiple King of Trios tournaments, and winning the Rey de Voladores tournament. He received even more global notoriety competing for multiple major US promotions, where he can be seen showing off his high-flying abilities. Who knows what heights Mark will reach in more ways than one! 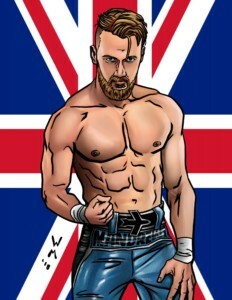 Mark Andrews joins Zack Sabre Jr. and Flash Morgan Webster as part of the 8-card Best of UK Wrestling game pack. The set will debut on July 14 at GalactiCon in Pittsburgh, and begin mailing worldwide soon soon thereafter. Get ready to add some awesome new global talent to your game collection! ← Come See Us on Our Summer Game Tour in 3 U.S. Cities!